A photograph of head table guests at 40th anniversary of Richmond Hill Women's Institute. 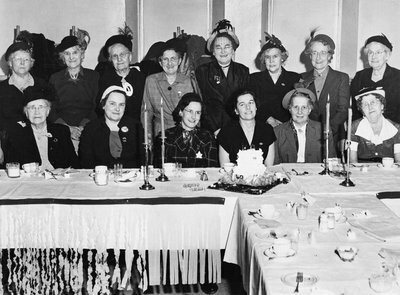 Front row (left to right): Mrs. A. L. Phipps, Past President; Mrs. G. Francey, East York; Mrs. C. Agnew, West York; Mrs. H.H. McKay, President; Mrs. N. Glass; Mrs. R. Cooper. Back row (left to right): Mrs. W. Tyndall; Miss Bertah Palmer, 1st Sec.-Treas. ; Mrs. J. Moore, Past President; Mrs. W. Sayers, Past President; Mrs. G. Irwin, Past President; Mrs. G. Yerex, Past President; Mrs. O.L. Wright; Mrs. W. Mylks. Phipps, A.L. ; Francey, G. ; Agnew, C. ; McKay, H.H. ; Glass, N. ; Cooper, R. ; Tyndall, W. ; Palmer, Bertah ; Moore, J. ; Sayers, W. ; Irwin, G. ; Yerex, G. ; Wright, O.L. ; Mylks, W.